For the last few years, there seems to have been a struggle for those organising events, as well as family supporters of people with dementia and professionals working in the sector, finding people with dementia to present at events. I believe this is no longer acceptable, as there are quite literally hundreds of us around the world living with dementia, willing, and able to represent ourselves. It continues to be completely unacceptable to have events “about us without us”. Perhaps giving up their position of knowledge and power over our stories is hard for those without dementia who have had the podiums and been on the panels, as yes historically, the people with dementia did not stand up and speak for themselves. It is our story, not theirs, and accordingly, people with dementia should be asked to not only contribute, we are the key to change. It is through the power of personal stories, usually that we can bring about the greatest change, yet it is people without dementia who seem to want this space. Perhaps, because they were not encouraged to, and also more likely, because we were never asked to. Imagine a disability event or panel, concerning disability issues, with a group of panelists none of whom had disabilities. The whole community would be outraged, yet when this continues to happen to people with dementia, almost no-one stands up for our rights, and those of us with dementia who do, get abused or ignored. In the last few days, I have had a lot of contact with a journalist from The Guardian UK, about including people with dementia on a panel for this topic: How can health and care integration help people living with dementia? Of course, the best people to discuss this, are people with dementia, and after much lobbying, eventually Dr Jennifer Bute from the UK was included as part of the panel. Dementia Alliance International made a comment on their website, which was removed. Luckily, I took a screen shot of it, added above. One would have hoped free speech was part of an organisation such as The Guardian, but it seems not. They obviously only wanted to receive feedback they felt comfortable with! 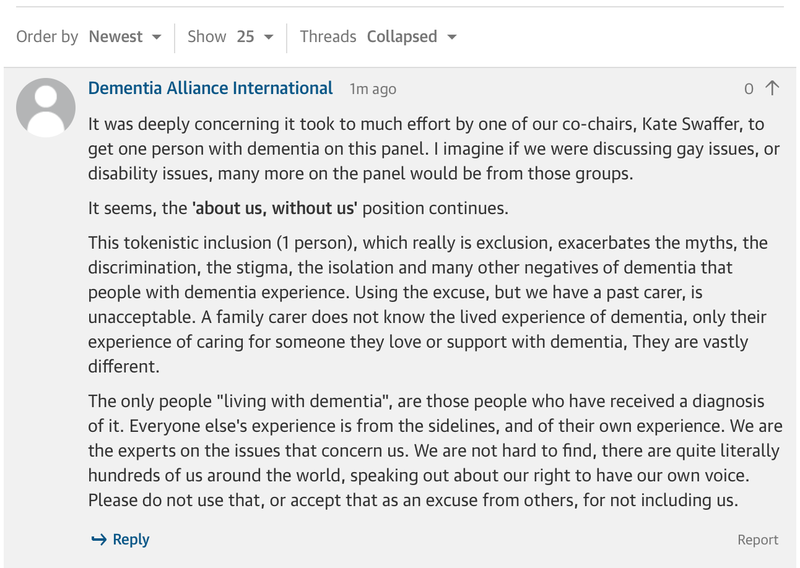 In this world of free speech, why did the Guardian take down the comment made by Dementia Alliance International, as attached? What an insult to the members of that group, of which I am one of the co-chairs! I would be pleased to write an article, as long as there is free speech allowed, and it would be published in full. This latest failure of your organisation, will be written up and published independently, with the attached screen shot included. You and The Guardian do yourself a great disservice, as well as one to people with dementia, in your lack of full inclusion, and unwillingness to allow free speech on the site! It seems, people with dementia are being treated as badly as people with disabilities over 40 years ago… at least by the Guardian. Thank you so much for putting me in touch with Dr Jennifer Bute. Her contribution to the discussion was invaluable. The Healthcare Professionals Network (on which the discussion was published) is aimed at professional audience where practitioners can share their knowledge and experience. It is absolutely right, of course, that service users and carers should be on the panel and we had both. The process for recruiting panellists for these discussions is not limited to a window of time – it’s an ongoing process and not over when I publish the discussion page. I hope you get the chance to read what was said and that you find it useful and interesting. Should you or anyone you know wish to contribute a piece about living with dementia, I would be very keen to run something on the network. It’s dementia week next week so the issue is very timely, although we do not limit coverage to days, weeks and/or months. Hello S***, Thanks for getting back to me. Not especially re our system here, but perhaps Australia is better in some areas, and worse in others! S*** said on May 12th: We’ve got a live discussion on Thursday 14 May from 12-2pm on how integration of health and social care can improve the lives of people with dementia. I have seen on twitter that you are asking various ‘professionals’ to participate on a panel on Living well with dementia. The reality, from my perspective, is that the only people to have as panelists on this particular panel topic, are those living with dementia, not people working in the sector. Or at least, they should be the majority. As a person living well with dementia in Australia, I would find it very tokenistic if a panel on that particular topic included one person with dementia, amongst a number of ‘experts’, many of whom are in commercial businesses, making money out of dementia, so it is promotion for them, and little to do with the reality of what living well with dementia means to people with dementia. We are the experts through the lived experience, and have our previous and current professional knowledge and talents to draw on. They do not disappear on diagnosis. If this happened in Australia, in 2015, there would be a tidal wave of protest. I am involved in a large global community of people with dementia, and could recommend a number of very good speakers and panelists, all people living well with dementia. I could also recommend some professionals, who I believe are actually the professional experts and academics of living well with dementia, to support your panel discussion. I hope you don’t mind I have connected, but it is important to include us. In keeping with the motto being used since 2000, by groups like the Scottish Dementia Working Group, and in line with the philosophy of dementia friendly communities, then it is imperative you include us. May 19, 2015 in Daily Blog. Tags: Author: Kate Swaffer © 2015, Dementia Alliance International, Dr Jennifer Bute, How can health and care integration help people living with dementia?, The Guardian UK, Who's story is it? I get the feeling that the voice of a person living with Dementia is a threat to the closed circle of “professional” folk who seem only interested in rationalising their funding. By allowing input by people living with Dementia, the inadequate operational practices would come to light. I feel frustrated by the politics that seem to surround giving people living with Dementia a voice. It feels like we are regarded as mindless second class citizens who can not add value at any level. For one, I am very excited about two seemingly current movements: 1) Being more careful with “language” when describing people with dementia and recognizing that many of the “Inappropriate Behaviors,” “Violence,” “Acting Out,” etc are more indicators of discomfort, fear, frustration, etc of not being able to communicate using the vary language that we so carelessly use! 2) Hearing from more people who have been diagnosed with dementia is so important to get a REAL picture of what is going on in their lives and on how they are and/or should be treated and cared for. I have to admit that as an educated, knowledgeable, caring person I almost didn’t see being a care giver from that angle. In my case, Gregory was unable to communicate his needs but I did know him so well after 40+ years of a wonderful relationship I was able to know (for the most part) and meet his needs in a loving, respectful, honorable way. Thanks Kate for being there! Kate, I have been lobbying for years for more women speakers on world stages in all disciplines. It’s an uphill battle to get equal representation, but like yours, one worth fighting. More women at every level… equal to men in the same positions, etc etc etc… it remains an uphill battle!